The weather has finally turned here in WNY, and golfers are hitting the links to chase the little white ball. While we have some great public courses, many golfers prefer the privacy and pampering of a country club. But not all clubs are the same. Sports humorist Jeff Wozer found the stop signs that you’ve joined a bad country club. Club’s golf pro, on the first hole, openly hopes this is the day he breaks 100. Beer cart girl only sells beer by the case. Sixteenth fairway water hazard is an above ground swimming pool. Every golf cart comes with a steering wheel lock. Designated water hazard drop zone suspiciously resembles a body chalk outline. 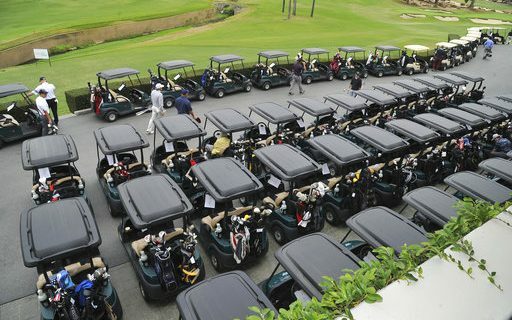 When putting, course advises against leaving valuables in golf cart. Golf pro carries in his bag a Wegman’s courtesy umbrella. Slow play caused by cart path DWI checkpoints. Pro shop doubles as a pawn shop. For more of Jeff’s humorous takes on Buffalo sports, including signs of a bad Little League coach and the least checked out sports books, visit his author’s section at Buffalo Sports Page.